The last decade has seen a growing interest in the Semantic Web, which extends the web of documents to a web of data. This technology applies web-based standards for encoding datasets and linking them to other published datasets, so that applications can exploit data from many different sources. It also provides standards for encoding general knowledge in ontologies, so allowing enhancements based on automatic reasoning (improved querying, for example). 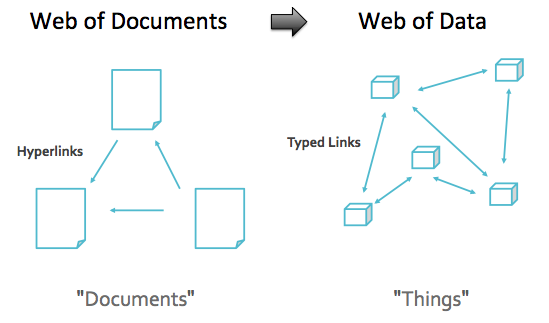 This article introduces Linked Data and related semantic technologies, and shows how they can be deployed in web applications. Attempts to answer such queries through text-based search are unreliable: we might equally retrieve a performance in which the soloist was Chinese, or a rock musician that plays Scandinavian music. Using semantic technologies, resources such as the audio file of the performance, or the photograph of the conductor, can be annotated using the Resource Description Framework (RDF). In this framework, formal names can be assigned to what are called resources, which would include Beethoven, his violin concerto, the orchestra, and the conductor. Names can also be assigned to types (or classes) of resource (composers, concertos, etc. ), and to relationships (or properties) that link resources (e.g., the "composed-by" relationship between composition and composer). By reasoning over facts encoded in this way, a query system can confirm that a performance was given by the Beijing Symphony Orchestra, that this orchestra is based in Beijing, that Beijing is located in China, and so forth -- thus combining geographical and musical knowledge in order to retrieve an answer. In designing these semantic technologies, a key design decision was to leave open the naming of resources and properties, provided that names conform to the format for web resource names -- that is, provided they are Uniform Resource Identifiers or URIs. All four of the above could be names for Beethoven, illustrating that the URI need not be human-readable (e.g., it might be an arbitrary string of letters and numbers), although identifiers should be resolvable to RDF representations that include human-readable labels, as explained below. If data from different sources are to be combined, it is therefore important to establish links, for instance through statements indicating that the above four URIs are synonymous. These statements, which can also be expressed in RDF, provide a means by which data published by many people or organisations can be combined into linked data. In the following chapters, we will show through practical examples how to describe resources in RDF, how to convert data from other formats to RDF, how to publish RDF data, and how to link published RDF to other datasets. We will also consider how to utilize existing linked data in applications for querying, analysis, mining, and visualisation. All these topics will be illustrated by the case scenario of a music portal. For examples of existing music portals, you can look at the BBC music reviews site, and the etree linked music site. These applications make use of a music ontology and a large dataset of musical information called MusicBrainz, which we will also exploit in our training material. Linked data results from a confluence of earlier ideas and technologies, including hypertext, databases, ontologies, markup languages, the Internet, and the World Wide Web. In this section we provide background information on these technologies. The Internet is an extension of the technology of computer networks. The earliest computers operated independently. In the 1960s and 1970s, it became common for computers in an organisation (e.g., university, government, company) to be linked together in a network. At the same time, there were early experiments in linking whole networks together, including the ARPANET in the United States. In the early 1980s, the Internet Protocol Suite (TCP/IP) for the ARPANET was standardised, to provide the basis for a network of networks that could embrace the whole world. The Internet spread mostly to Europe and Australia during the 1980s, and to the rest of the world during the 1990s. The technology supporting the Internet includes the IP (Internet Protocol) system for addressing computers, so that messages can be routed from one computer to another. Each computer on the Internet is assigned an IP number which can be written as four integers from 0--255 separated by dots, e.g. 185.56.200.4. (To be precise, this convention holds for version 4 of the IP, but not the more recent version 6.) The structure of messages is governed by application protocols that vary according to the service required (e.g., email, telephony, file transfer, hypertext). Examples of such protocols are FTP (File Transfer), USENET, and HTTP (HyperText Transfer). The concept of hypertext is normally dated from Bush and Wang's 1945 article "As we may think" , which proposed an organisation of external records (books, papers, photographs) corresponding to the association of ideas in human memory. By the 1960s, with more advanced computer technology, this concept was implemented by pioneers such as Douglas Engelbart and Ted Nelson in programs that allowed texts (or other media) to be viewed with some spans marked as hyperlinks, through which the reader could jump to another document. Informally people often use the terms "Internet" and "World Wide Web" (WWW) interchangeably, but this is inaccurate: the WWW is in fact just one of many services delivered over the Internet. The distinctive feature of the WWW is that it is a hypertext application, which exploits the Internet to allow cross-linking of documents all over the world. The formal proposal for the WWW, and prototype software, were produced in 1990 by Tim Berners-Lee , and elaborated over the next few years. The basic idea is that a client application called a web browser obtains access to a document stored on another computer by sending a message, over the Internet, to a web server application, which sends back the source code for the document. Documents (or web pages) are written in the Hypertext Markup Language (HTML), which allows some spans to be marked as hyperlinks to a document at a specified location in the web, named using a Universal Resource Locator (URL). When the user clicks on a hyperlink, the browser finds the IP address associated with the URL, and sends a message to this IP address requesting the HTML file at the given location in the server's file system; on receipt, this file is displayed in the browser. Citation: Nova Spivack's illustration of the evolution of the WWW. In 1993 came a turning point for the WWW with the introduction of the Mosaic web browser, which could display graphics as well as text. From that date, usage of the web grew rapidly, although most users operated only as consumers of content, not producers. During this early phase of web development, sometimes called Web 1.0, web pages were mostly static documents read from a server and displayed on a client, with no options for users to contribute content, or for content to be tailored to a user's specific demands. These Web 2.0 technologies have made possible a wide range of social web sites now familiar to everyone, including chat rooms, blogs, wikis, product reviews, e-markets, and crowdsourcing. Previously a consumer of content provided by others, the web user has now become a prosumer, capable of adding information to a web page, and in this way communicating not only with the server, but through the server with other clients as well. During the 1990s, Berners-Lee and collaborators developed proposals for a further stage of web development known as the Semantic Web. This far-reaching concept, first publicised in a 2001 article in the Scientific American , is partly implemented in the current stage of web development sometimes called Web 3.0. 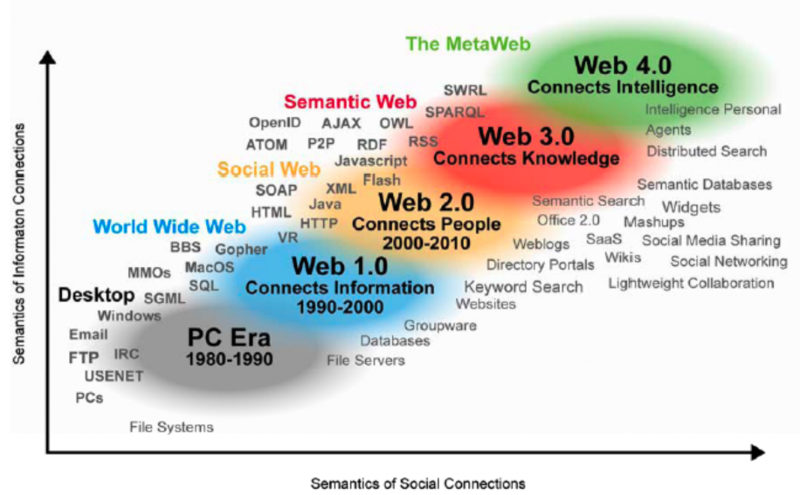 At present we cannot see clearly what lies beyond Web 3.0, but in Figure 1 we allow for future stages in Semantic Web development by including a loosely defined further stage "Web 4.0". In their 2001 article, Berners-Lee and co-authors pointed out that existing web content was usable by people but not by computer applications. There were many computer applications available for tasks like planning, or scheduling, or analysis, but they worked only on data files in some standard logical format, not on information presented in natural language text. A person could plan an itinerary by looking at web pages giving flight schedules, hotel locations, and so forth, but it was not yet possible (then as now) for programs to extract such information reliably from text-based web pages. The initial aim of the Semantic Web is to provide standards through which people can publish documents that consist of data, or perhaps a mixture of data and text, so allowing programs to combine data from many datasets, just as a person can combine information from many text documents in order to solve a problem or perform a task. There is something odd about this pair of facts: having said that the Beatles are a music group, why must we add the more generic fact that they are a group? Must we list these two facts for all music groups -- not to mention all groups of acrobats or actors etc.? Must we also add all other consequences of being a music group, such as performing music and playing musical instruments? It is now sufficient to state that the Beatles (and the Rolling Stones, etc.) are music groups, and the more general fact that they are groups can be derived through inference. 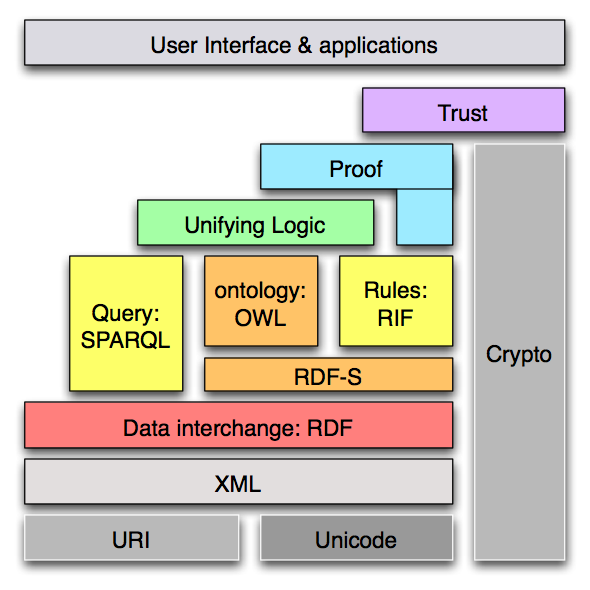 Ontologies thus enhance the value of data by allowing a computer application to infer, automatically, many essential facts that may be obvious to a person but not to a program. To allow automatic inference, ontologies may be encoded in some version of mathematical logic. There are many formal logics, which vary in expressivity (the meanings that can be expressed) and tractability (the speed with which inferences can be drawn). To be useful in practical applications it is necessary to trade expressivity for tractability, and description logic, which is implemented in the Web Ontology Language OWL, does precisely this. However, despite these restrictions on expressivity, OWL cannot yet be used efficiently for inference over very large datasets, as required by Linked Data applications. For this reason, most reasoning for Linked Data relies on the far simpler logical resources of RDF-Schema, with OWL used sparingly if at all. The technologies described in the previous section are implemented through a number of standard protocols and languages, with probably familiar acronyms like HTTP, URI, XML, RDF, RDFS, OWL, SPARQL. You can look up details of these standards as needed, but as background it is useful to know a little about each one, and in particular what they are for. The later standards in this list build on the earlier ones, so they are often described as a stack of languages, as shown in Figure 3. From using the World Wide Web, most people are familiar with the HTTP prefix in front of web addresses such as http://musicbrainz.org/. The meaning of this acronym is HyperText Transfer Protocol, and it refers to a set of conventions governing communication between a client and a server. More precisely, these conventions define the structure of request messages from client to server, and response messages from server to client. Message structure varies from one protocol to another: thus a different protocol such as FTP (File Transfer Protocol) will define a different message structure. A request messages in HTTP consists essentially of a method to be applied to a resource. The fundamental method is GET, which requests the server to send back a representation of the resource, typically an HTML file that can be displayed in a browser pane. However, there are several other methods including DELETE, which deletes the resource, and POST, which submits data to be processed with respect to the resource. The resource, specified through a relative document ID (often a filename/path on the server), may be a document, or picture, or an executable that will generate data for the response. A Uniform Resource Identifier (URI) is defined in the standard  as "a compact sequence of characters that identifies an abstract or physical resource". The word "compact" here means that the string must contain no space characters (or other white-space padding). "Abstract or physical" means that the URI may refer to an abstract resource such as the concepts "Beethoven" and "symphony", as well as to a document or other file that can be retrieved from the WWW. The definition of a correctly formed URI is quite complicated, with constituents that vary according to the scheme (the initial constituent before the colon), which specifies the relevant internet protocol, such as HTTP. For an HTTP URI, the other constituents most relevant for our purposes are the authority, and the path, which occur in that order. The authority specifies the server where the resource (if it really exists) is located. Finally, the path locates the resource precisely within the server's directory structure. Thus for the URL given above, "http" is the scheme, "musicbrainz.org" is the authority, and "/doc/Frequently_Asked_Questions" is the path; the other characters such as the colon are punctuation separating these constituents. Since URIs are typically long, and hence difficult to read and write, it is convenient to make use of abbreviated forms known as "compact URIs" or "CURIEs". A compact URI consists simply of a namespace and a local name, separated by a colon. Typically, the namespace includes the scheme, the authority, and perhaps the early part of the path; the local name contains the remainder of the URI, chosen so as to convey intuitively what the URI means, while observing some syntactic restrictions (e.g., there should be no further use of the characters "/" and "#"). Thus in the example just given, one could introduce a namespace "dbp" for http://dbpedia.org/resource/, so reducing the URI to "dbp:Karlsruhe", where the local name preserves the substring that is significant to human readers. We will use this convenient method of abbreviation often in the rest of this book. In the mid-1990s, the newly formed World Wide Web Consortium (abbreviated W3C) set up a working group to simplify and rework SGML to meet the requirements of the WWW. The result was the first XML specification, which became a W3C recommendation in 1998, and has become the standard convention for data exchange over the web. The essential advance on SGML is that XML is simpler and stricter: to give just one example, it is permissible in SGML (but not in XML) to omit closing tags, as in the common practice of inserting <p> without a closing </p> when writing HTML. Citation: Semantic Web Language stack - architectural layers. The Resource Description Framework (RDF) was introduced originally as a data model for metadata, which are attributes of a document, or image, or program, etc. such as its author, date, location, and coding standards. First published as a W3C recommendation in 1999 , the framework has since been updated, and generalised in its purpose to cover not only metadata (strictly interpreted) but knowledge of all kinds. The basic idea of RDF is a very simple one: namely, that statements are represented as triples of the form subject--predicate--object, each triple expressing a relation (represented by the predicate resource) between the subject and object resources. Formally, the subject is expressed by a URI or a blank node, the predicate by a URI, and the object by a URI or a literal such as a number or string. Here the subject is abbreviated using the "base" statement, and the object is abbreviated using the "prefix" statement. The very simple predicate "a" relies on a further Turtle shorthand for very commonly used predicates, and refers to the "type" relation between a resource and its class. This can be seen from the following equivalent Turtle statement, in which all URIs are shown in their cumbersome unabbreviated form. Note that this statement should occupy a single line, although it is shown here with wrapping so that it fits on the page. The format in which every URI in a Turtle statement is fully expanded is also known as NTriples. A resource representing the class of all classes. Used as a predicate to mean that the subject is a subclass of the object. Used as a predicate to mean that the subject is a sub-property of the object. Used as a predicate when the subject is a property and the object is the class that is domain of this property. Used as a predicate when the subject is a property and the object is the class that is range of this property. The following statements in Turtle serve to illustrate these RDFS resources. Note that they use abbreviated URLs for which the prefixes are given above. The second and third statements above give the domain and range of the property "mo:member". Intuitively, their meaning is that if "mo:member" is employed as predicate in a triple, its subject will belong to the class "mo:MusicGroup", and its object to the class "foaf:Agent". The fourth statement means that any resource belonging to the class "mo:MusicGroup" will also belong to the (more general) class "foaf:Group". Associates a resource with a human-readable description of it. Associates a resource with a human-readable label for it. Associates a resource with another resource that might provide additional information about it. A sub-property of "rdfs:seeAlso", indicating a resource that contains a definition of the subject resource. 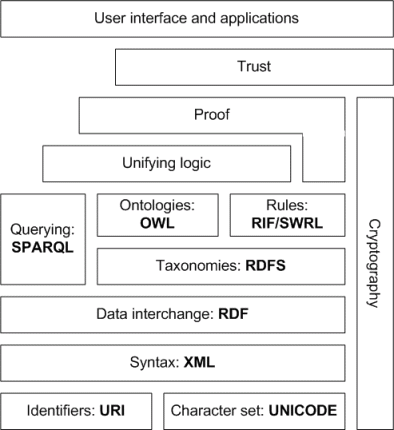 The Web Ontology Language (OWL) extends RDFS to provide an implementation of a description logic, capable of expressing more complex general statements about individuals, classes and properties. OWL was developed in the early 2000s and became a W3C standard (along with RDFS) in 2004. The acronym OWL was preferred to the more logical WOL because it is easier to pronounce, provides a handy logo, and is suggestive of wisdom. Of course the name also reminds us of the character in "Winnie the Pooh" who misspells his name "Wol". The reason for choosing description logic, rather than a more expressive kind of mathematical logic, has already been mentioned: the aim was to achieve fast scalable reasoning services, and hence to use a logic for which efficient reasoning algorithms were already available. In fact description logics are more a family of languages than a single language. They can be thought of as a palette of operators for constructing classes, properties and statements, from which the user can make different selections, so obtaining fragments with different profiles of expressivity and tractability. Used informally to refer to RDF graphs considered as OWL 2 ontologies and interpreted using the RDF-Based Semantics. 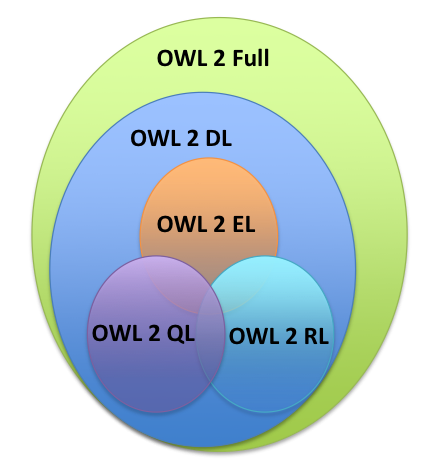 Used informally to refer to OWL 2 ontologies interpreted using the formal semantics of Description Logic ("Direct Semantics"). A simple fragment limited to basic classification, allowing reasoning in polynomial time. A fragment designed to be translatable to querying in relational databases. A fragment designed to be efficiently implementable using rule-based reasoners. Individual axioms: statements about individuals, including class membership, and whether two resources represent the same individual or different individuals. The SPARQL Protocol and RDF Query Language (a recursive acronymn, since it contains itself) is a language for formulating queries over RDF data. It is the Semantic Web's counterpart to SQL (Structure Query Language), which has been a standard language for querying relational databases since the 1980s. SPARQL is a recent addition to the Semantic Web stack of languages, having been recommended as a W3C standard in 2008 . There is an album A made by the Beatles. Album A has the title AN. There is a track T on album A. Track T has the title TT. Or more colloquially: retrieve the titles of all tracks on albums by the Beatles, along with the corresponding album titles. The response should be a list of pairs, each containing an album name and a track title. OPTIONAL, which specifies data that should be retrieved if available, while allowing the query to succeed even when they are unavailable. For more information on these more complex constructs, see Chapter 3. LinkedData.Center provides you with a fully configured and fully managed server that exposes a private SPARQL endpont. Thanks to high capacity RDF storage (included in the service) you are able to load any number of RDF triple and query ther resulting graph using SPARQL. This article is based on the results of EUCLID project (EU FP7 - 296229). Except for third party materials and otherwise stated, the content of this article is made available under a Creative Commons Attribution 3.0 Unported License.